Ben 10 is going to clean that mess in a facility. Transform into a huge and extremely powerful wolverine and kill your enemies by using sharp claws! Are you ready to play for a huge wolverine or some alien creature? Well, as far as you could guess Ben 10 is back again! Enter the facility, transform into a huge and mighty wolverine and attack your enemies with claws, sharp like blades. Collect bonuses and unleash incredible power within! 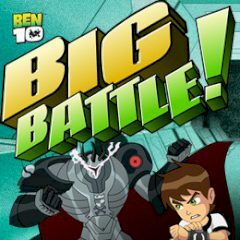 Games Similar Ben 10 Big Battle!